ISLAMABAD: Pakistan on Wednesday rejected Washington’s decision to place it on a blacklist of countries that violate religious freedom, branding it “politically motivated” and defending its treatment of minorities. “Pakistan does not need counsel by any individual country (on) how to protect the rights of its minorities,“ a statement from the foreign ministry said, adding that Islamabad “rejects” the designation. The statement came a day after US Secretary of State Mike Pompeo announced that he had designated Pakistan among “countries of particular concern” in a congressionally mandated annual report. The move means the US government is obliged to exert pressure, including imposing sanctions if necessary, to end freedom violations. It comes more than 40 days after a Pakistani court exonerated Asia Bibi, a Christian woman who had spent eight years on death row for blasphemy. She remains in protective custody in an unknown location after violent protests against her acquittal. 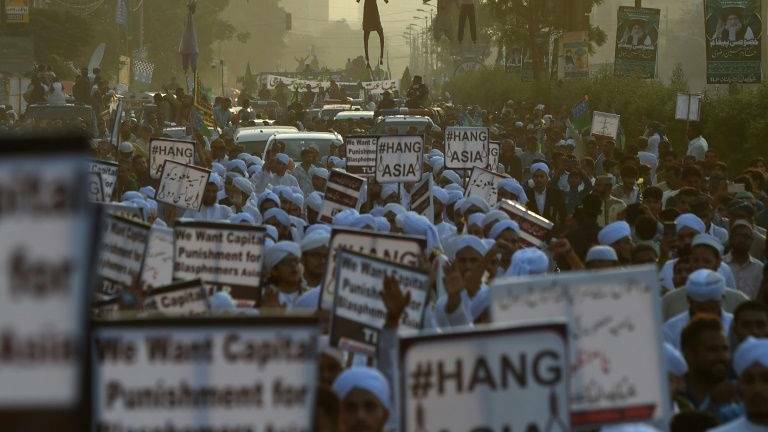 Blasphemy is an inflammatory charge in Pakistan, and high-profile vigilante murders and mob lynchings have been carried out in the past. Bibi is currently seeking asylum abroad. Her family claims her life will be in danger if she remains in Pakistan. Pakistan recently charged a hardline cleric, Khadim Hussain Rizvi, with terrorism and sedition after he led violent protests against Bibi’s acquittal. The foreign ministry statement did not mention her, or the issue of blasphemy. “Pakistan is a multi-religious and pluralistic society where people of diverse faiths and denominations live together,“ it said. It also warned that honesty would have required Washington to examine the “exponential rise in Islamophobia and anti-Semitism in the US”. Human rights advocates have long voiced alarm about the treatment of religious minorities in Pakistan, including Shiites, Christians and the Ahmadis, whom Islamabad forbids from identifying as Muslim. The State Department had earlier held off on condemning Pakistan, a vital gateway for US forces in Afghanistan. But it last year placed Pakistan on a special watch list — a step short of the designation — and Washington has separately curbed military assistance. Pakistan says around four percent of its total population comprises citizens belonging to Christian, Hindu, Budhists and Sikh faiths. Nine countries remained for another year on the list of “Countries of Particular Concern” — China, Eritrea, Iran, Myanmar, North Korea, Saudi Arabia, Sudan, Tajikistan and Turkmenistan.